Ever since the first bunny-eared model stepped onto the Louis Vuitton Fall Catwalk and after Madonna donned them at the Met Galas people have been wondering, why the bunny ears? This was years ago and I am STILL not over it !!! I remember purchasing my own lace bunny ears from Bcbg Maxazria and was inspired to incorporate them for a gala I attended .all though I regrettably ditched them at the last moment losing my confidence. But why??!! I do love the French coquette aspect and it's definitely fun and whimsical. And really..me questioning my confidence in fashion? GASP. 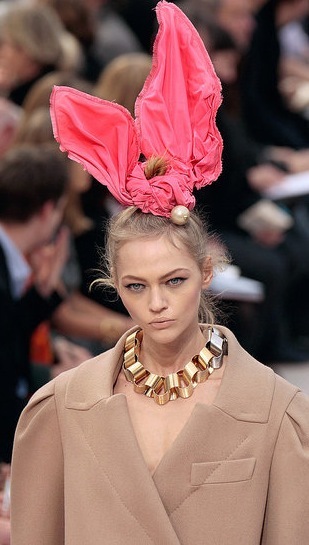 Anyhow EVERY Easter I think of that incredibly memorable Louis Vuitton runway show and I simply just adore the frou-frou bunny ears. I know Lady Gaga feels the same way. I mean she has too , right? I cannot possibly be alone in this. Perhaps we should all make these and wear them to a summer garden party ??! And someone please be incredibly ambitious and wear a pair to Easter brunch with the in-laws today!